The new Guntō of the army and the navy made the model the Hyōgo Kusari Tachi and the Tachi of the Kamakura period. Sarute Tsukaito Menuki Mekugi Wooden scabbard enter into a metaled scabbard. 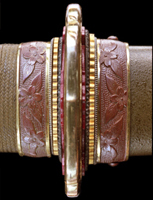 The rayskin of the hilt of a navy sword applies black Japanese lacquer. A hilt pastes together the magnolia of two sheets which carved the shape of the swod-tang with boiled rice paste. The rayskin(Same-gawa) is wound around the whole hilt for reinforcement the Tsuka-ito, and the hilt , and the skid of grip hand. By informality and second-half type mounting, the rayskin is stuck only on the side of the hilt. sword is still cloth. The rayskin of a navy sword applies black Japanese lacquer. beginning. The standard of assignment is inscribed when rolling a Tsuka-ito. 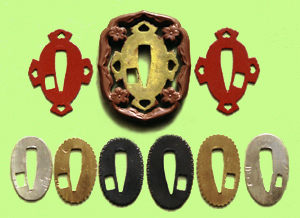 The grace of a Guntō mounting is decided by the kind and number of sheets of a washers. Furthermore, an army sword has grace in the guard of a openwork. 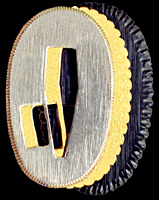 The first-class mounting(Koshirae) has four-kind the washers of eight sheets. 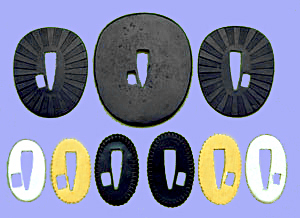 The kind and number of sheets of a washers are omitted by the Koshirae manufactured in the second-the third grade and middle-last stage at the wartime. There are two kinds of swords, a "sword" and a "Tachi." It is a "Tachi-Mei" although the swordsmith Mei is minced to the front with the photograph. It is called "Mei" to have cut fine reversely of this photograph. The manufacture time etc. by the side of opposite of a Mei is called a "Ura(back) Mei." hung it at a level with a hip girdle with the belt picking string(Obitori). by the method of this operation. All the swords of the Edo period are Uchigatana-mountings. Since a Uchigatana-mounting is aslant put between the waist-belt, a blade is short compared with a Tachi. The display of a Japanese sword has formal manners. How to place the photograph published upwards is formal. The side which is visible to the front, respectively is the surface of "a Tachi and a Katana.